Your Best Source for Cleaning Tools, Supplies, Dispensers, Paper Products,Trash Can Liners, Equipment Rentals, Deodorizers, and More! Cappello Janitorial Supplies is Orange County's best choice for cleaning supplies and equipment, such as paper goods, cleaning chemicals, trash liners, dispensers, window cleaning tools, carpet and floor care equipment, and more. In business for more than 50 years, we are authorized dealers for some of the most-trusted brands in the cleaning industry, including Fox Green, Scott, Eco-Soft, Georgia Pacific, Kimberly Clark, Eco-Soft, Sanitare, Unger, Raven, Steam Pro 90 and others. Our inventory is constantly expanding, and we also sell cleaning products from our own private label, allowing customers to find the best cleaning products for their needs and budget. Combined with timely delivery, knowledgeable staff members and competitive pricing, we offer Orange County homeowners and businesses an incredible value. 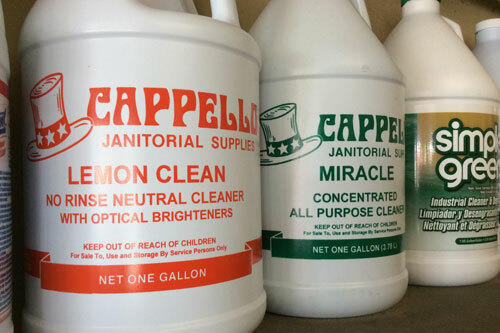 At Cappello Janitorial Supplies, we carry a huge inventory of cleaning supplies, including aerosols, speciality cleaners, trash can liners, buckets, wringers, squeegees, window cleaning equipment, carts, sponges, buckets, and more. We also carry a complete selection of cleaning chemicals, including porcelain tile cleaners, super-degreasers, lime, scale and rust removers, brighteners, toilet bowl cleaners, deodorizers, all-purpose cleaners, disinfectants, mildew removers, drain openers, oven cleaners, muriatic acid, clear ammonia, enzyme cleaners and more. And, if you're looking to replenish your paper supplies, we sell standard 2-ply toilet paper, jumbo toilet paper (9-inch), half-fold toilet seat covers, multi-fold paper towels, single-fold paper towels, perforated towels, enMotion paper towels, roll towels (8 inch) and other paper products. When it comes to floor care and maintenance in Orange County, Cappello Janitorial Supplies has you covered. We sell a complete selection of floor care supplies, including brooms, mops, mop heads, mop handles, waxes, finishes, sealers, strippers, sweeping compounds and more. We even sell (and rent) professional-grade carpet and floor care machines, including wet and dry vacuums, scrubbers, floor machines, polishers, air movers, carpet extractors, and more. Our entire selection is well-maintained and available with related accessories, such as our floor pads that come in all available levels of abrasiveness. We even repair vacuums and sell common vacuum replacement parts. Need something specific? Cappello Janitorial Supplies will happily accommodate special orders, from custom-sized trash liners to truckloads of single items for a large event or company. In business since 1964, we even have the expertise to make sure you get the most out of your purchase. We'll listen to your specific cleaning needs and offer you expert cleaning guidance, recommendations, safety tips and more, all so you can feel confident about using our cleaning chemicals, floor machines, commercial vacuums, and other janitorial equipment. Call today for product inquiries, rental pricing, general questions and orders. And Much More! Special Orders Welcome; Call Today!